« WHAT IS AN “ASK GENN” CRYSTAL READING? A REVIEW OF RECORD KEEPERS – WHAT ARE THEY? Because they are surface features, you have to know how to see them. I have covered this before, but I will briefly repeat it here. 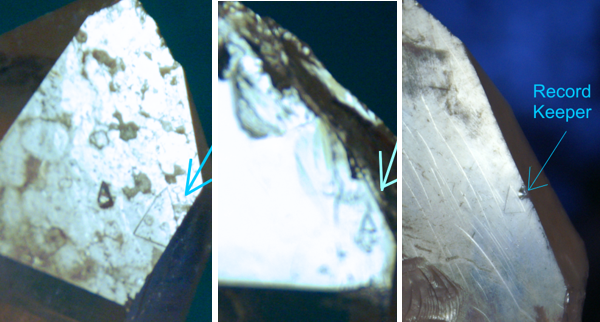 To view the surface features, you need to keep from looking inside of the crystal. 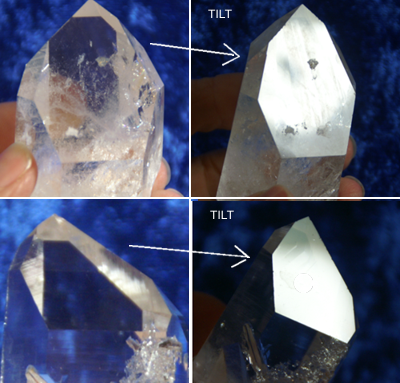 Hold your crystal with the face you are looking at parallel to a light source. This way you can use the glare that the light creates in order to see what is on the surface (see photo). Features that were “invisible” are now seen. HOW DO RECORD KEEPERS AND THE STORAGE OF INFORMATION WORK? Many books talk about how a Record Keeper crystal will find its way to the person who needs the information it contains. That Record Keepers contain special wisdom specific to this person. The question I most often get about Record Keepers and the storage of information then, is how does this work? Is the information contained inside these crystals with Record Keepers? If so, does the person “miss out” on the information if they don’t meet up with “their” special Record Keeper crystal (or crystals)? These are great questions. Let’s see what information Crystal Guide Venus offers. Record Keepers may be what I call “traditional” or “non-traditional”. 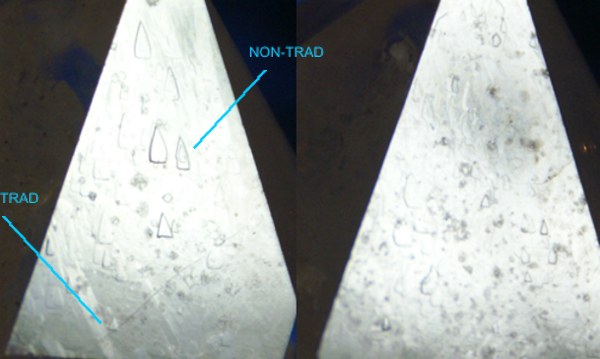 “Traditional” have sharp pointed triangular shapes, “non-traditional” are tear-drop shaped. Both work the same way. IS THE INFORMATION “STORED” INSIDE RECORD KEEPERS? So, if a Record Keeper crystal finds its way to the person who needs the information it contains and if the special wisdom is specific to this person, how is the information stored? From what my Crystal Guide, Venus, has described to me, any of the Record Keeper crystals can be used to access this special knowledge. It isn’t really “stored” on or in the crystal in the way that we typically think of information being stored. Actually, any crystal can retrieve this special knowledge. Record Keepers serve to trigger something in our mind that helps in the connection to this information. Wait. If this knowledge can be accessed by any crystal, then why are Record Keepers said to contain “special knowledge specific to the person” holding the Record Keeper crystal? When the person receives the crystal with the Recorder, it is an indication to the person that it is time to access this special knowledge. CAN A PERSON “MISS OUT” ON THEIR SPECIAL INFORMATION? Initially, (and wrongly, I might add), I imagined that the information was kind of “burned” into the crystal, like data burned onto a CD. Contrary to this, Venus says the crystal serves more as a portal to that information. It is both stored on and through the crystal. I am sent a visual of this process, and it looks like an energetic portal, with substance. It starts at the crystal and, like a rope made of energy and star-stuff, connects to the information in that way. The best picture I could find online to represent this was this photo of pulling taffy. Add some swirly energy and sparkly stuff and it is a pretty close approximation to what Venus showed me. As you see, this is unlike how information is stored on our CD’s or other storage devices. The access to the information, then, is between the seeker and the information. The Record Keeper crystal serves as a conduit to, not the final resting place of, the information. Venus showed me another version using the example of our computers. She says we access information that is stored on the web VIA our computer. All of the information accessible on the web isn’t printed IN or ON our computer. Venus then reminds me that in our more evolved state, we are able to access this information without the aid of a computer. That is another story for another day. For now, we need our computer to access this knowledge. In this comparison, then, the Record Keeper crystal is the computer. It is accessing the information stored in the Cosmos (on the web in our example). Like the crystalline energies I have spoken about before, (regarding The One) crystalline energies are mostly both on and off-planet. The crystalline energies aren’t stuck inside a physical crystal body deep in the earth forever until they are brought out into the light. The Crystalline Energies/Entities come and go. They inhabit the crystal body and do their work. They go back and forth from in the earth to out of the earth, and in the crystal body to out of the crystal body. The Crystalline Energies are vibrating, healing, shining and spreading light from all dimensions. Both from deep within the earth as well as from the outside of the earth (and their crystal bodies). HOW WERE RECORD KEEPERS (AND CRYSTALS IN GENERAL) SEEDED AGAIN? Regarding the seeding of crystals, I was shown/guided that a lot of things were done in a much different way than we do them now. The visual I was given was that, for instance, the seeding of the crystal beds here in Arkansas wasn’t done like a physical shovel-and-hoe-dirt garden. It was explained that, at that time, things were done with their minds so much more than with their physical beings. The crystal beds were seeded (by mind) and tended (by mind) and the Record Keepers were created (by mind) and accessed (by mind). We are currently making our way back to doing things in this, much more efficient, way. I hope this blog post has helped to explain how crystals with Record Keepers and the storage of information works. Rather than imagining your Record Keeper crystal containing a finite bit of information burned onto its surface, know that the Record Keeper has access to infinite information, specific to you, which is accessed via this energetic portal. Are you looking for a Record Keeper crystal? You can find some here at Arkansas Crystal Works! Tagged crystal types: record keepers. Bookmark the permalink. Thank you for this enlightening post! It really resonates with my feelings about crystals and my experiences with how they “work”. So much more a fluid energy interaction with their energy being than just a “finite” materialistic thing. Love your blog posts, I have learned so much! Thank you so much for your wonderful explanation of Record Keepers! It clears up a lot of misunderstanding for me.